Take me down to Mexico City where the wins are big and the symbols are pretty! Greentube and Novomatic have teamed up to make this excellent Mexican-inspired slot game. All the best exports of Mexico feature in this game. You’ll see cacti, tequila, hot sauce, chilis, sombreros and tacos! The main characters of the game are three friends, or Tres Amigos as they are professionally known. They are all brunette and have wonderfully creative moustaches and pearly white teeth. They’re all bearing huge smiles and are wearing matching sombreros. It’s possible to win Free Games in this slot and you can win extra bonuses with the help of your three Mexican friends. Tres Amigos has 20 winlines across 5 reels and 3 rows. You can see the Mexican desert beyond the reels, complete with cacti and rocks. The whole slot is a marvel for the eyes! Even the simplest of symbols in Tres Amigos have embellishments and are decorated with Mexican-style patterns. The RTP for Tres Amigos is just over average at 95.03%. If you have played any of these other games from Novomatic and enjoyed them then Tres Amigos will definitely put a smile on your face: Monkey’s Millions, Sizzling Hot Deluxe, Cops n Robbers Vegas Vacation, Little Dragons, Lucky Lady's Charm, Chili Heat and Hypno Hippo. The minimum bet is 0.01 and the maximum bet is 50.00. The symbols are friendly in this game – in fact, they’re almost as friendly as the three amigos! You’ll feel like they’re your friends when they start matching up and giving you sizeable wins. Real friends make you happy with their company but these Mexican friends will make you happy with their payouts! As tradition dictates, there are some card symbols in the game which are the low-paying symbols. They’re all decorated nicely and they’re colourful! You’ll see the pink 10, the blue Jack, the green Queen, the red King and the yellow Ace. There’s also a symbol showing a steaming hot taco next to some hot sauce and another symbol showing a bottle of tequila and some limes! Fun fact: tequila was never originally served with lime wedges, and the tradition started only to help bad tequila get down the hatch! Another symbol is the cactus and then the highest-paying symbol in the game is the horse. The horse symbol requires 2 or more matches on a payline and the other symbols require 3 or more matches on a payline. The 20 paylines can be turned on or off and you can play on a minimum of 1 payline. The paylines payout only for consecutive matches from left to right. Tres Amigos has the signature Novomatic slots gamble feature which you can use when you get a payout – if you want to heat things up like hot sauce! There’s a very appropriate Wild symbol in Tres Amigos and that’s a red, hot chili. Mexico produces many native chilis! Some of the world’s favourite chilis are grown there. One of the hottest is the Habanero and people also love the humble Jalapeno! The red hot chili can help any other symbol get a payout by filling in for a missing one. The chili Wild symbol can’t help fill in for the Scatter, though. The sombrero symbol is the Scatter symbol! 3 of these sombrero symbols is the best thing to spin because it will give you 10 free spins! Every win you get from the free spins will be multiplied by 2 automatically, and maybe more! That’s because the Tres Amigos are on duty during the free spins. They can land on reel 1, reel 3 or reel 5. If you spin an Amigo on Reel 1, he will give you some extra spins! If you spin an Amigo on reel 3, he will give you a bonus prize. 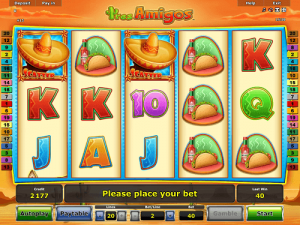 If you spin an Amigo on reel 5, he will increase your win multiplier. The bonus prizes can go up to 50x your bet and the win multipliers can increase to 10x!